Expansion appliance- what is it? What is an expansion appliance and what does it do? Some children are born with an upper jaw that is too narrow and small. As a result, it does not fit correctly with the lower jaw. This causes a crossbite of the back teeth, and sometimes even the front teeth. An expansion appliance is used to make the narrow upper jaw grow wider. This is possible because when we are born, our upper jaw is actually two separate bones, divided in the middle from front to back. These two bones grow together usually around the age of 17 or 18. 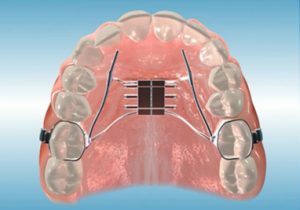 Once this happens, an expansion appliance can no longer be used to spread the two halves of the upper jaw apart and make it grow wider. Adults need a surgery to make a narrow jaw wider. 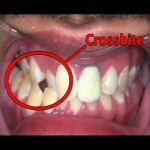 It is best to correct a crossbite as early as possible, usually around the age of 7 or 8. This can prevent abnormal growth of both jaws. This is one type of first phase treatment, also called early treatment. What does an expansion appliance not do? It cannot make the lower jaw grow wider. This is because unlike the upper jaw, the lower jaw is one solid bone almost from birth. It cannot prevent the extraction of permanent teeth in cases of severe crowding. Putting an expansion appliance in simply because a child’s teeth are crowded is not proper treatment. If the upper jaw is the correct size, making it wider with an expansion appliance will then make it not fit with the lower jaw. If you are told that your child needs an expansion appliance or you think your child may need one, the best thing to do is consult an orthodontic specialist.